This chapter exposes the dragon bloodline more than a thousand years after Jesus Prophesied/Ordained the destruction of Jerusalem. It shows that the Rus were part and parcel with the Franks in forming the Templars, and this supports my findings that Franks and Russians were from the same stock of peoples: the Redones. It’s up to you to decide whether the Templars came to inhabit the city in His good will, or whether they were attempting to do their own. My mind is definitely made up. After the first Crusader wave of Vatican-sponsored French fighters attacked their Muslim enemies north of Palestine, they invaded Jerusalem. Led through the city walls (1099 AD) by a Godfrey de Bouillon (duke of Lower Lorraine), the "Christians" slaughtered unmercifully even the Jewish inhabitants. For his prize, De Bouillon was chosen ruler of the city, but died the next year...if that tells you how blessed he was of God. And the Pope who dispatched him had also died...before hearing about the Jerusalem victory. The Vatican had not only proclaimed that God was forever done with the Jews, but it also held to the doctrine of amillennialism i.e. that the Millennial Kingdom of God was already under way through the Vatican, and with the Pope as Christ on earth. Therefore, Catholics, and least of all the counterfeit-Christian Crusaders, were simply not interested in setting up a Jewish homeland in Palestine. In fact, the Crusaders persecuted the Jews who wished to partake in their Jerusalem scheme. Don't let anyone convince you, as ecumenists in the pulpits would like to, that the Crusader leaders were Christians, for it is Jesus Christ who defines what true Christians are, and He does not consider murderers of Jews, thieves and rapists to be his saints. The dragon bloodline at this time, while still too weak to over-power the Vatican's grip on Europe, took on a Christian facade to secure Vatican support in their world-rule scheme. It's likely that, at some point, especially in the early 1300s, the Vatican caught on, after which there was mortal conflict between the two powers. A leader of the Crusade, Baldwin I, brother of the late Godfrey de Bouillon, was then chosen to be the king of Jerusalem. After Baldwin died (1118), a third brother, Eustace III, was elected king...but while on his way to Jerusalem to accept the title, the Crusaders made his nephew, Baldwin II, king instead, even though he was not entitled. I'm curious as to why this took place. The so-called "Rose Line" has been said to be the bloodline of Jesus Christ (via intimate relations with Mary Magdalene) that, through the centuries, came to produce the three brothers above. I don't believe the Jesus-and-Magdalene part of the claim, of course, which is thought to be a claim peculiar to the Merovingians, but I do believe that the Rose Line existed. I'm not so sure that these French brothers had as much to do with the Line as others did, namely the descendants of Rollo the Viking. I have not heard of anyone attaching the Rose Line or the Rosicrucians to the Scandinavians, which is why I view it as a Ros Line; keep in mind, therefore, as you read this chapter, that it's my personal theory/discovery. It's a key that led me to discover the deepest roots of the Rosicrucians. Two of the three brothers did not come to rule Jerusalem by chance, but were maneuvered into position by those seeking to found a flesh-powered Biblical Millennium. After the Crusaders had won Jerusalem, most returned home whereas a small lot, including the original nine Templars, held the region as though their main purpose was to maintain it until something larger should transpire, which thing I see as world rule. For Jerusalem was not the only target of the Templar agenda, but there was also Byzantium i.e. the eastern half of the Roman empire. I see that Viking blood (i.e. the Normans) was involved in the same Crusader agenda along with the Frenchmen. It has come to my knowledge satisfactorily that both the Norse and the French were descended from the same stock of Gauls that are now labeled by historians, "La Tene Celts." These are generally regarded as having previously been the Halstatt Celts of Illyrium. Godfrey de Bouillon had sold Bouillon, his title there, and the Bouillon castle, in order to finance his part in the Crusade. Talk about wild abandon. This war and related agenda obviously meant the sky to him. But Robert II, a Norman (and the duke of Normandy), son of William the Conqueror and therefore a descendant of the St. Clair or Rollo-Viking line, "pawned Normandy to [his brother] Rufus so that he [Robert] could be the leader of the first crusade" (Britannica Vol. 11, page 358). Therefore, that Crusade was very important to both of these French and Norman "noble" families. Moreover, Britannica tells us that De Bouillon was not the Crusade's primary leader, but that "Bohemund [I] was the principal leader of the crusade" (1970; Vol. 10, page 514). Now Bohemund I, when he joined the Crusade, "gathered a fine Norman army" for the purpose (Vol. 3, page 855). Fifteen years prior to the Crusade, Bohemund's Norman father, Robert Guiscard, and Guiscard's brother, Roger I, had led a Norman army from southern Italy against the Byzantine kingdom north of Israel. Prior to that, they conquered the Byzantines of southern Italy, which is why they ruled that part of Italy in the first place. One could therefore conjecture that the ultimate Norman purpose in the heart of the Mediterranean was to pave an eastward Norman road to Jerusalem...and that the first Crusade (1096) was spurred first and foremost by that Norman agenda. The rising up of the Bouillon circle of French fighters then becomes a competitive response to the Norman vision. In this light, I can make a suggestion to all who perceive the Rose Line as stemming through the Merovingian Franks (i.e. to the De Bouillon family): that's only a part of the story, while another part is the Scandinavian right to the Rose-Line agenda, just as much or more than the Merovingians. Those who would buck against this suggestion should know that the Merovingians worshipped Odin and other gods worshiped by the Scandinavians. That is, both peoples shared the same roots. The Viking army settled in southern Italy had attacked the papal powers and the Byzantine empire virtually all at once, and this seems a strike at world rulership. Guiscard had defeated the Vatican (1053) but thereafter made peace with a new Pope in order to have little to fear in Italy while waging war in Byzantine regions. Back in the north, other Normans were active militarily and were proving quite successful in Britain and on the French mainland. Had the Byzantines not made an alliance with the Varangian Rus of proto-Russia (who were themselves from Sweden), the Scandinavians just may have conquered the world at that time. As it turned out, the Varangian Rus fought against the Italian Normans on behalf of the Byzantines. Peter the Hermit, a man given overwhelming credit for rousing the French and other Europeans to engage in the first Jerusalem Crusade, was first in Bali (1094), southern Italy...realm of the Guiscard Normans. This further supports my belief that the conquest of Israel was initially a Norman goal, joined by the Vatican/French only after the Normans had made the first plans/assaults to that end. By that time, the papal powers had formed an alliance with the Italian Normans so that the whole Jerusalem affair became a competition between the Popes, the Normans and the French even while the three worked together as one. In an article on the Normans, Britannica shares that the shocking slaughter in Jerusalem is explained by its similarity to typical Viking bloodbaths. And in the early Templar period, there were three places where the Templar-related Order of Sion had monasteries: Palestine, France, and southern Italy. A French-Norman alliance is therefore implied in the make-up of the original Templars and/or the near-legendary Order of Sion. Allegedly, monks from southern Italy (Calabria) built the monastery in France, and they with Godfrey de Bouillon formed the Order of Sion. Just one generation prior to the Crusade, England had fallen to the Norman, William the Conqueror, a St. Clair, wherefore one could speculate with some logic that the Normans had chosen a St. Clair to represent their Rose Line. Very interesting is that the Dictionary of Royal Lineage, while not indicating the personalities involved, tells that Guiscard's family was itself from the Rollo line. In modern times, Pierre Plantard de St. Clair claimed to have been the Order's leader until 1984. I don't know quite what to make of that, but there you have the elite Norman name attached to a Frenchman to this day. Something dark is shaking up there in the land of the frogs. Rollo, after his fathers led a series of invasions onto the French mainland, succeeded in winning a region at the north shore of France called, "Normandy." This land was won by the treaty, St. Clair-sur-Epte (911), made with the French king (the "St. Clair" part refers to Rollo). As part of this arrangement, Rollo would become the first duke of Normandy, but in return was to accept Christianity and moreover Christianize his pagan people (albeit Rollo lived thereafter, and died, as a pagan). Herein begins a mix of Catholicism with Viking paganism that, along with the Viking drive to rule the world, was apt to create a form of Millennialism that was pure sewage in the face of God. "Of course, the spelling of the day of "Rose line" was "Roslin." The above website echoes what others are suggesting, that the Rose Line was the bloodline of Jesus and his mistress, Mary of Magdala. But that's a silly idea intended to take us (and naive Freemasons) deliberately off course. We even hear claims that the head of Jesus is buried under the Roslin chapel...but you understand that this idea comes with the wicked implication that Jesus did not truly die on the Cross nor rise to life. If we ask why William Sinclair was granted Roslin by the king of Scotland (Malcolm III), it's because Edgar's sister, Margaret, married that king while William was her cupbearer. And if we ask why Margaret had a cupbearer with Viking blood, I'd say it was because Margaret herself had plenty of the same. The question that I can't answer just yet is when the Roslin name/village originated, either when overseen by the Sinclairs for the first time (1070ish), or in an earlier period. We find that William's son, Henry Sinclair, joined Godfrey de Bouillon on the first Crusade. And De Bouillon himself had as father, Eustace II (from Boulogne, on the French coast facing Scandanavia), who had been married to Goda...whose half-Viking blood was of the Rollo/Sinclair line. That is, Goda had as mother, Emma, daughter of Richard I, duke of Normandy (942-96), grandson of Rollo. Although Eustace II was married to Goda, it is reported by historians that Godfrey de Bouillon, and his two brothers in line for the Jerusalem throne, were born from Eustace's second wife, Ida of Bouillon. In other words, there was apparently no Viking blood in these three brothers. Yet, their father (Eustace II) fought for the English crown at William the Conqueror's side. One could therefore conjecture that strong ties between the royal Sinclairs and the elite Bouillon family were formed at the invasion of England (i.e. Battle of Hastings). But by that time, Guiscard was already in Italy, and had already formed ties with the Vatican on that front. Always keep in mind that these momentary lights were not the heroes that they considered themselves, but beasts fit only to be captured and punished. Now Emma (Goda's mother) had been married to two men, first to a king of the Anglo Saxons, Aethelred II, and, after he died, to a Viking pirate and king of Denmark, Canute, who conveniently "converted" to Christianity and thereafter fought against pagan Viking enemies who were coveting parts of his enlarged empire. Aethelred fathered king Edmund II Ironside reportedly from another wife named "Aelfgifu" -- alternative "Elgiva." But something smells like a cover up here, not just because little is known about Elgiva, but because the first wife, Emma, was also called "Elgiva," especially in the Anglo-Saxon Chronicles, suggesting that the two women could have been one and the same. If so, then Edmund Ironside was Emma's son and therefore half Viking! And that would be the reason for the cover up (if Christian-Viking rulers didn't want their sons to be recognized as stemming from pagan Vikings, they could attempt successfully to hide it). Moreover, Canute married Aethelred's widow, Emma, but was at first married to an Aelfgifu that is as mysterious historically as the Aelfgifa reportedly married to Aethelred. In fact, some historians suggest that Canute's Aelfgifu was one and the same Aethelred's Aelfgifu...but even if so, we can't lose sight of the fact that both men had been married to Emma who for some confusing reason was also known as "Aelfgifu." What I am suggesting is that the Norman Ros(e) Line may stem (from the Rollo dynasty) through Emma to Ironside...he being a king who moreover married the daughter of a Danish Viking, wherefore Ironside's son, Edward the Aetheling, was three-quarters Viking if indeed Ironside's mother was a Viking (the history books tell us that Edward was a Saxon). But even if Emma was not Ironside's mother, and there was in fact another Aelgifu who was, the latter may also have been of Viking kin (no one seems to know the identity of her parents). If that isn't enough, the Saxons themselves are suspect as cousins to the Rollo line because, as many suggest, the Saxons were none other than Sacae i.e. Scythians. The reason that I have burdened you with some details is that Edward the Aetheling's children were the said prince Edgar the Aetheling and his sister, Margaret. This could be very important because Margaret (who was in this way born with Viking blood) became closely associated with Roslin while the first Vikings, according to Britannica, had settled "Erethlyn" (Wales). That word looks as though it could mean, "of Rethlyn," which looks a lot like "Roslin" and it's ancient alternative, "Rosslyn." In 1112, the count of Champagne (France) had sent Hugh de Payen ("Pagan") to Jerusalem with a letter addressed to the (Merovingian?) king of Jerusalem, Baldwin I. Then, in Jerusalem itself, under the oversight of Baldwin, De Payen began to unite a small group of closely-related men in an unofficial formation of an order of Temple Knights...and the count of Champagne would himself be included in that organization. The following year, Baldwin married the daughter (Adelaide) of a late Viking leader, Roger I (Guiscard's brother), under the condition that his son, Roger II, should become king of Jerusalem when and if Baldwin should die without a child. One could interpret this deal as Baldwin's agreement not to have children, so as to grant the throne to the Normans. Amazingly, Baldwin, although married to two women, was to die without children. The Patriarch of Jerusalem (i.e. the powers of the Eastern Orthodox Church) caused Baldwin to betray his deal with Roger II and his mother, Adelaide. Baldwin thereby divorced her, and then he died a year later (1118) without an heir. The Patriarch then urged yet another betrayal, the ascension of Baldwin II (Count of Rethel), merely Baldwin's cousin/nephew, to the Jerusalem throne...instead of the rightful heir, Eustace III (the latter was brother to Baldwin (I) and supposedly of the Merovingians). Now, queen Margaret of Scotland had previously given one of her daughters in marriage to Eustace III -- with the hope of seeing her bloodline on the throne of Jerusalem, apparently -- but, as described above, to no avail. Britannica tells us that Baldwin II was chosen (over Eustace III) because his cousin, Joscelin, persuaded the barons of Jerusalem to so choose. I note that Joscelin was from England's House of Courtenay, and may therefore have been acting as the hand of the Sinclair/Norman king of England, Henry I, who, because he had married yet another daughter of queen Margaret, thus had a possible motive for not seeing Eustace III (who also married a daughter of Margaret) on the Jerusalem throne. Whatever the fledgling Templars may have thought of the decision to crown Baldwin II instead, we find that they had such license under him that immediately (1118) De Payen officially formed, and was elected Grand Master of, the "Poor Knights of the Temple of Solomon" (i.e. the Templars). Moreover, Baldwin fulfilled for the knights their important request to call the Jerusalem Temple their home. Baldwin II had partaken in the first Crusade, by the way, and for 18 years prior to his Jerusalem election, he had been the Count (and protector) of Edessa, north of Jerusalem and much closer to Georgia. With king David in the midst of removing the Seljuk Turks from Georgia, Joscelin and king Baldwin joined forces to fight against the Muslims with the "Italian" Normans still in support; in fact, Bohemund II (Guiscard's grandson) had married a daughter of Baldwin II in 1126...so we see that Viking blood was yet vying for the Jerusalem throne. In the meantime, with king Baldwin pre-occupied in military affairs far from Jerusalem, the Templars, while living in the "basement" of the Temple Mount, and armed with picks and shovels, dug deep to the foundations of the old Temple built by Solomon. We don't know for certain what their secret mission was, but Albert Pike (centuries later) claimed that they had intended to build Ezekiel's Temple (see Ezekiel 40). If true, it reinforces the theory wherein the Templars had a (counterfeit) Biblical Millennium in mind. And it explains why the Templars were also to become stone masons (as well as knights)...because they had experience in masonry from the very start. We do not know what the Templars found buried at the Jerusalem Temple, but with much ado in 1126, De Payen headed west and with passion had discussions in France with Bernard the mystic monk of Clairvaux. Together, De Payen and Bernard drew up plans to secure Vatican support for the Templar cause...and succeeded at the Council of Troyes (1128) (note how "Troyes" in France evokes the Greek-theater Troy of the Trojans). The monk was the nephew/cousin of one of the founders of the Templars, Andre de Montbard, and while Montbard went on to become a Grand Master of the Templars, Bernard would doggedly become a Templar work horse and loyal administrator...so as to lay the foundation for a huge Templar empire that would rule Europe invisibly, shoulder to shoulder with the Pope. Thus, the French and Catholic elements of the Jerusalem scheme came to greatly overshadow the Norman elements, but only on the mainland. In England and Scotland, the situation was different. After building Templar support for a short duration in France, De Payen crossed the English channel to meet king Henry I, who gave the Grand Master blessings and gifts. Henry was the son of William (St. Clair) the Conqueror, of Rollo blood. Now Baldwin II died in 1131 without a son, as had Baldwin I. Amazing. With Bohemund II, also of Rollo/Sinclair blood, having married a daughter of Baldwin II, the Jerusalem throne might finally have gone to the Northmen. Alas, a couple of years before his death, Baldwin (II), apparently in opposition to the kingship passing to Bohemund, offered the throne to Fulk V, count of Anjou, by offering his elder daughter in marriage. Fulk accepted her in 1129 and thus went on to become the next king. Earlier, perhaps while anticipating that Fulk and/or his son (Geoffrey Plantagenet) might ascend to the Jerusalem throne, Henry I had given his daughter -- i.e. Margaret's granddaughter -- to Fulk's son. It was this marriage that created the so-called "Plantagenet" dynasty that would go on to furnish the House of York, depicted by a white rose and viewed tentatively by myself as the White Rose Line. While the meaning of "Plantagenet" is said to remain unknown, I can't help but note the "gene" in that title. But, alas, alas, alas, the blood of the Vikings (including Margaret's) would fail again to sit on the Jerusalem throne because it was another son of Fulk V (Baldwin III) that would get the crown. The Dissolution of the Monasteries...was the formal process, taking place between 1536 and 1540, by which King Henry VIII confiscated the property of the Roman Catholic institutions in England and arrogated them for himself as the new head of the Church of England." It was immediately after Elizabeth's death that the Stewarts entered upon the English throne, in the reign of the Scot, James I, who was of Rollo stock via the Bruce kings of Scotland. The Ros Line, if indeed it was a line of ruling Vikings, may have branched out into Kiev via the Varangian Rus. The Varangian ruler in the days of Margaret was Yaroslav, son of the great Vladimir who had followed Rollo's lead in converting to Christianity for merely political protection. Yaroslav had given four, perhaps five, of his daughters to European kings, one of whom was Harald III Hardraade of the Norwegian Vikings. Prior to finding refuge in Hungary, Margaret was not only protected in Kiev by Yaroslav himself, but before that by Harald III in Norway (not to mention by Olaf II, king of Norway). Clearly, Margaret's family was an important one to the Vikings, and it could certainly be true that they understood she to be of the Ros Line. If Margaret's family was important due to its Rollo blood, so also her brother, Edgar. As heir to the English throne, he was extremely promising in placing Rollo blood in that key position. As it turned out, a duke of Normandy (The Conqueror), with Rollo blood, ended up on the English throne before Edgar could, hereafter Edgar's bloodline never did become enthroned, anywhere. And so what was Margaret to do but to give her daughter to Henry I in order to reinforce his Rollo blood for her heir? Henry died without a male heir, wherefore the male line of Rollo comes to an end with him. But Henry's daughter produced Henry II, etc., until, with the end of the royal Rollo line at the death of Elizabeth I, another Ros Line, from the Varangian Rus, namely, the Drummond clan of Scotland, took its place on the English throne...and has continued there to this day! The Drummond Ros Line and its roots in the Varangian Rus is the subject of a coming chapter, but keep in the back of your mind until then that the pre-tribulation rapture was born in a Drummond cult, whose founder was a major English banker from a banking family in some cahoots with Rothschild banker(s). Margaret's blood remained in Scottish kings all the way to, but not including, the Bruce dynasty. The Drummond bloodline entered the line of Scottish kings in the Bruce dynasty, namely, when Annabel Drummond married Robert de Bruce III. Now the Bruce family had been from Normandy and was also related to the Rollo bloodline! Remember this when I say, "Drummond Ros Line" (which I could just as rightly refer to as the "Bruce Ros Line" and/or "Rollo Ros Line"). The son of Robert III and Annabel was king James I of Scotland, and this dynastic line would continue through successive James'. Because the Stuart, James VI of Scotland, ruled England immediately after Elizabeth I (as James I of England), the Margaret or Roslin Ros Line was replaced just then by the Drummond Ros Line. It is no wonder that the Drummond clan supported the Stuarts. However, Sinclairs were privy counselors to the Scottish James' and even to Mary Queen of Scots, but in those days, Rosicrucians had infiltrated the royal courts of many European monarchs, not to support them, but to bring them down. Elizabeth I welcomed Rosicrucians into her court even as her spies, but it can be determined that these particular Rosicrucians had been supportive of, if not related by blood to, the Margaret/Roslin Ros Line. Hugh de Payen, on his return home from the Jerusalem Temple, and after visiting Henry I (of England) briefly to fill him in on the Middle-East affair, ended his westward journey in Scotland with his in-laws, the Sinclairs! Yes, Hugh de Payen the Frenchman had married Catherine, a Roslin Sinclair. Was he the glue that bonded the Normans to the French, therefore, so as to enable a Crusader army to be mustered large enough to win Jerusalem? Where had De Payen's finest loyalties been as Grand Master of the Templars, to the French or to the Normans? And was the idea of digging below the Temple Mount and/or to build Ezekiel's Temple -- and therefore the idea of a Utopian Millennium -- that of the Frenchmen, or of the Norman Sinclairs? The answer to that is, I think, to the one group that was associated with a Hebrew organization having Millennialism as an agenda. The Khazars of Magog come to mind, who had been ruled by Hebrews, some of which were Millennial-minded (i.e. Zionistic) to a militant degree. On the one hand, the Gnostic Cathars, believed by some to have been a branch of Khazars, were in France just then and in close association with the Templars. Yet again, the Kabars of Hungary -- a branch of Khazars -- may have entered Scotland with Margaret's friends so as to become tied to the Sinclairs. The Scottish house of Sinclair, although not achieving royal status, went on to great wealth and power, even organizing the infamous Freemason brotherhood out of stone masons (Freemasonry was the formation of smokescreen churches i.e. "lodges" which allowed memberships of non stone workers for use in power-politics and social engineering). Prior to the Freemason period, the Templars had been stone workers in building castles, forts, and cathedrals (the cathedrals were often esoteric monuments intended more for power-grabbing than for religious worship). From 1307, when the Templars in France were being chased out of the country by a major persecution, many took shelter in Scotland under the wings of the Roslin Sinclairs...and the Scottish king, Robert I de Bruce, welcomed the knights with open arms. The first Grand Master of Masonry in Scotland was (another) William Sinclair of Roslin Castle. His descendant, another William Sinclair yet, laid (in 1446) the foundations of the esoteric cathedral, Rosslyn Chapel (on the same hill as Roslin Castle). This cathedral, every square inch of which is laced with carvings, was built in French style, suggesting that it was indeed built by the French Templars who had escaped to Scotland. One particular design on the walls of the Rosslyn Chapel matches perfectly with Freemasonry's first-degree ceremony, still practiced today, in which a blindfolded initiate stands between two pillars of Solomon's Temple with a noose dangling from neck, placed there by a Templar (see website above). This carving is what so concretely ties the Roslin Templars with the Freemasons of later years! The village of Roslin was built specifically to house the masons who, over 40 years, built the Chapel. Carved in the ceilings are stars (pentagrams) and roses, both having affinity with Rosicrucianism, the stars depicting the cult's astrology, and the roses its secret. In fact, the rose on the Rosicrucian rose-and-cross logo may secretly depict the pentagram because a rose has five petals while a pentagram has five points. Also carved throughout are Freemasonic as well as pagan symbols, including over 100 "green men" corresponding to an unknown concept well outside the realm of Christianity. Moreover, Hermes is depicted, which again connects with Rosicrucianism rather than the Judaism of Jerusalem. The building was cleverly dubbed, "The Bible in Stone," which it is not; instead, the phrase reminds us of pyramidology, the occult idea that certain secrets of God are Inspired within the building's dimensions, shapes, angles, and carvings. The skull-and-crossbone symbol used by the Templars, also found in the Chapel, is said to represent the bones of Mary Magdalene...whom the Templars actually possessed and worshipped, or so we are to believe. 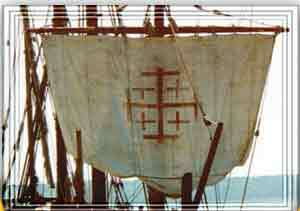 But the facts that we know are these: 1) the skull-and-crossbone symbol was a pirate-flag symbol; 2) the Rus Vikings were pirates while pagans, especially between 800-1050; 3) the Templars reverted to piracy on the high seas after losing Jerusalem for good; 4) the crossbones form an X-shape, even as does the Scottish flag. 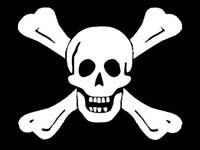 I suspect the Scottish flag to be the old pirate flag in disguise, but without the skull. In fact, the Scottish flag, called "Andrew's Cross," dates back to the 12th century, just one century after the first Templars. A common line explaining the flag's origin is that clouds in the sky formed an X-shape during a certain battle, wherefore, we are to believe, someone recognized it as the Apostle Andrew's cross upon which he was killed. That sounds like a load of potatoes to me, to disguise the reality. If indeed the Rosicrucian cross represented the crossed bones of the pirate flag, then the rose that Rosicrucians place at the center of their cross could represent the skull of the pirate flag...where the skull represents their hidden/occult mysteries. Note that "school" is similar to "skull" and that Rosicrucians called themselves the "Invisible College" prior to usurping most of our schools. Even the Skull and Bones society in the United States is based at Yale. Note also that in colleges to this day there are "degrees," evoking the degrees of Freemasonry. And the odd black hat with the flat, square top that proud faces wear on graduation day represents a mortar board i.e. the mortar board used by stone masons. America is much controlled by this cult. 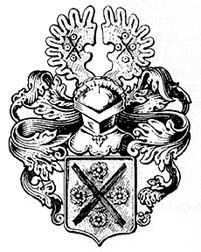 While the modern cross of Rosicrucians is not like the Scottish Cross in the form of a X -- called a "saltire" -- but is instead upright like the cross of Christ, the early Rosicrucian cross was a saltire, as you can see from the 16th-century Andreae Family Crest (Johan Andreae was a leading Rosicrucian). The four roses that surround this cross had been, much earlier, four small crosses in the Jerusalem flag of the Templars, the very same design used by the Church of the Lutheran Confession centuries later. The same design is also found in the Church of the Holy Sepulcher (in Jerusalem), and is now the central icon on the floor of the National Cathedral in Washington DC. Isaac Newton was a leading Rosicrucian, and so behold that the Newton family crest is two bones forming a saltire cross!! If that's not enough, the Templar flag was exactly the flag of Georgia, the same Caucasian Georgia that assisted the Templars in the Crusade. Do I smell a Gogi enterprise, therefore, in the Rosicrucians? Who's the Wheel Dragon Line? home of the god, Eridanus.